It's a big beautiful platform. Try it for 60 days. Then select a free or paid plan. You don't have anything in your cart to pay for today. Your new charges are shown below. Estimated total excluding taxes. All prices in USD. 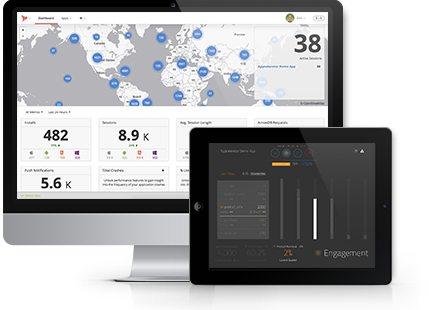 All plans include our comprehensive mobile analytics dashboard with one million monthly analytic events. We find this is more than enough for most customers. If your needs exceed these limits, contact us to discuss a custom plan tailored to your needs. Single seat. A great place for solo devs to start. Serious power. Perfect for growing mobile businesses. Premium support, customizable set-up, enterprise scale. Purchase cloud capacity using Container Points and allocate to containers. Each container can run a single application. Select the number of containers needed to run your server-side applications and we will calculate the required points. Don't worry! Container points can be reallocated at anytime. Our enterprise plans for cloud capacity have you covered. Pre-built, scalable cloud services to accelerate your server-side apps. The number of analytics events that can be sent. Enables usage of Crash Analytics. Integrate cloud and on-premises systems. Yes, you may upgrade or downgrade plans at any time. Downgrades will be effective as of your next renewal date. Do I have to buy cloud capacity? No. If you’re looking only for front-end (client) development, and don’t have any need for push notifications, cloud storage, or any other cloud service, there’s no need to purchase cloud capacity. If I don’t buy cloud capacity now, can I come back and add it later? Do I need to have a seat in order to use cloud services? Nope! If you need only the cloud backend, you can buy just a cloud capacity plan and use with the front-end technology of your choice. Is there a limit to how many Indie seats I can have? Yes. The Indie plan delivers a single seat that cannot see or share work with other seats. It is a great choice for solo devs working on independent projects. Plans are renewed annually automatically. How does purchasing additional seats affect my renewal date? If you add additional Pro or Enterprise seats to your account, the new seat(s) will have the same renewal date as your original Pro or Enterprise plan. The cost of the new Pro or Enterprise seat(s) will be prorated accordingly. Is there a charge per target mobile platform/OS? No way! Every seat in every plan allows for development to all supported mobile platforms: iOS, Android and Windows. When it comes to stewed prunes, are three enough? Are four too many? Go easy when using any kind of stewed fruit. Why wait? Jump in now for free! Purpose-built from the ground up on the principles of mobile and cloud to meet the needs of a post-web world. Each Appcelerator plan lets you build mobile apps for all supported target operating systems (including mobile web), without any additional fee. Use one of the most popular and fastest growing languages for both client and backend development. Built on open-standards, full access to the underlying mobile OS, vibrant marketplace for Platform extensions. Don’t want to pay for and stitch together multiple offerings from multiple vendors? Our Platform lets you build, connect, test, and monitor your apps all for a single price.